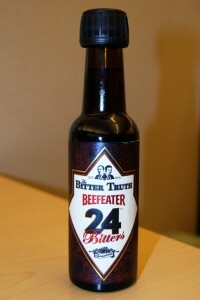 I love Beefeater 24 Gin, and I love Bitter Truth bitters, so I was a bit bitter that I didn’t seem to have much of a chance to get my hands on my very own bottle of the Bitter Truth’s Beefeater 24 bitters. That was until Michael Dietsch announced his “Don’t Be Bitter” contest over at A Dash of Bitters. All I have to do is give some link love to a fellow blogger and talk about a time I was bitter about their good fortune. At the top of my list is Tiare over at A Mountain of Crushed Ice. Not only does she take great photos and invent wonderful tiki drinks, but she’s always getting rums I can never dream of getting my hands on. It’s not just that she torments us U.S. bloggers by prominently featuring Havana Club rums in her sidebar1. She is continually reviewing delicious sounding Demerara rums that apparently only she can get. Her month of mai tais sounds positively sinful, and would set me back a fortune to try to replicate. I’m sure it wasn’t too cheap for her, having to import rums all the way to Sweden, but somehow she does it, and she does it oh so very well! It would soothe my envy to receive a bottle of Beefeater 24 bitters, but even if I don’t win, I’ll keep reading Tiare’s wonderful blog, and think you should to! I almost start to feel guilty now because i happen to have those rums so close at hand, and nah, most of them aren´t even expensive to get hold of only a few (to make things worse). It was long time ago now i got me some new demerara to review, maybe its time soon i write demerara rums part 3 as i have promised to do.. Apparently i need to remedy that next year and double up the demeraras. Stevi, i hope you win these bitters, you deserve it! ……and if i do i promise i will share half the content with you.